The parish was founded in January 2003, and worships inside an Anglican church which was built in 1877. I will not go into detail on the inside of the church building, as such a description will more properly belong to the review of the Anglican church itself once I visit one of their services there. Simply put, the inside of the building follows a standard layout for an Anglican church. I arrived a several minutes before the Orthodox service started, and so was able to see a “transformation” of sorts as things were set up – icons of biblical scenes from the New Testament were taken out and put on the windowsills along the walls, and a large figure of the crucifixion was placed at the front of the church, in the sanctuary. With no iconostasis, two large icons – one of Christ and one of the Virgin Mary – were brought out and put on either side of the entrance to the sanctuary. Some of the pews were then moved so as to make room for a stand for books from which the choir could sing from. A priest and a deacon conducted the service, both dressed in red and gold vestments. The priest had a white cassock on underneath, and a high-backed phelonion (chasuble). There was also a choir of several people, who sung most of the prayers. Unlike the other three Orthodox churches that I have so far visited (in Upper Norwood, Battersea, and Camberwell), there was no steady swell of people from a small group to near a hundred with somebody coming through the door every few minutes as I had seen elsewhere. Instead, the service started with about thirty people, and the congregation had reached roughly seventy by about an hour into the service, (including the choir), a number which stayed constant from there onwards. Also unlike the other Orthodox churches I have visited, the congregation was not overly “ethnic” – there were certainly a lot of ethnic minorities, with many nationalities listed on the parish’s website, but it was not mostly Russian as the Greek churches I have visited were mostly Greek. Furthermore, the male/female and young/elderly proportion was much more balanced than in the other Orthodox churches, which had mostly female and elderly congregations. As with nearly all Sunday morning Orthodox church communion services, the Liturgy of St. John Chrysostom was held when I visited. This meant that the service had the same structure as the other Orthodox services I have visited, but there were two main differences. First, the tunes to which the prayers were sung were different, Russian rather than Greek (I also noticed that the icons were in a slightly different style, but other than such superficial differences there are – despite a common misconception – no real differences between the different “flavours” of Orthodox Christianity). The second was that the service was nearly all in English! A few of the prayers were in Greek or Church Slavonic (a liturgical language used in Slavic Orthodox churches such as the Russian and Bulgarian), but only as many as were in English in the mostly Greek services at the other Orthodox churches I had visited. As with all Orthodox services (I explain this more fully in my review of Sts. Constantine and Helen), nearly all of it consisted of prayers, psalms and short hymns being chanted and sung by the priests, deacon or choir, and so it made a huge difference to be able to understand what was being prayed and chanted and not just to make educated guesses based on prior research (which the average visitor may not have) as to what was going on. The service started at 11:30. One male member of the choir (who I at first thought was a lone chanter until the people standing around him later joined in) started singing and chanting prayers, but unfortunately he had no microphone and I did not find that he projected his voice very well, making it difficult to hear what he was saying. While these initial prayers were being sung, members of the congregation went about the church lighting candles at the front and venerating icons, until after about ten minutes the rest of the choir joined in, and the priest begun to chant some of the prayers as well. The readings were 1 Corinthians 6:12-20 and Luke 15:11-32. The sermon took place straight after the gospel reading, the parable of the Prodigal Son, and was on said parable. Communion began at about 13:30 with people lining up to go forward and receive it, with the last person taking communion about 15 minutes later. As in the other Orthodox churches I had visited, after receiving communion they would also be given a piece of blessed but non-consecrated bread taken from the loaf from which the communion bread had been cut (antidoron), but what differed was that here they were also afterwards given a cup of watered down non-consecrated wine, which is the custom in the Russian tradition – this serves the practical purpose of ensuring that none of the consecrated communion elements (which are believed to be the Body and Blood of Christ) remain in the mouth. After communion was served, there were more prayers, then announcements, after which the service finished. The service lasted approximately two hours and twenty minutes. I must conclude by stating that this church – despite not even having its own building – is almost certainly the best in south London for a non-Greek interested in Orthodoxy to attend, although without the wonderful decoration of an Orthodox church building it admittedly does not really have the same atmosphere as the other three I have reviewed. There are other Orthodox churches in London, but due to the geographical limitations of my reviews, I must limit myself to the four which I have already visited. At the end of the service, members of the congregation went up to the priest at the front to kiss his blessing cross and receive left-over pieces of antidoron. There was a parish sale being held in an adjoining hall after the service, with lunches for sale and stalls with icons, books, cakes, and various items of bric-a-brac. The church building was built in 1873. It was originally home to a congregation of the “Catholic Apostolic Church”, (also known as Irvingism, an Anglo-Catholic splinter group founded in the late 19th century) which vacated the building in 1961, it having been bombed during the Second World War in 1941. The Orthodox Church acquired the building in 1963, and it gained the status of a cathedral in 1977. The inside of the church is absolutely full of art. I don’t think any more depictions of saints or Biblical scenes could be fit on the wall if they tried, although there is a bit of room left on the ceiling! The walls are quite literally covered in paintings and frescoes, including depictions of the Ascension, the Transfiguration, the four Evangelists, Daniel in the lion’s den, and even a large mural of the Last Supper clearly inspired by the da Vinci painting. There are also numerous icons around the church on the walls and pillars, depicting New Testament scenes such as the baptism of Christ and the Annunciation, and saints such as the Prophet Elijah, Saint George, Saint Marina, and of course the Virgin Mary. Even the ceiling was decorated, with a large painting of Christ flanked by angels set above the congregation. At the back of the church is a large font, and at the front is the sanctuary, with the altar behind an iconostasis as is the norm in Orthodox churches. To the right of the sanctuary is a small side-chapel like area, with its own small iconostasis and a large stand for candles – the walls of this area depict scenes from Holy Week, such as the entrance into Jerusalem and Jesus being taken down from the cross. The service was held by two priests, an older one in green vestments and a younger one in red vestments. Six male chanters dressed in smart suits sung most of the various prayers and psalms, and some other men in suits carried some of the items in the procession with the communion. As I have come to expect in Orthodox churches, the congregation grew considerably as the service progressed. There were only four elderly ladies there when I arrived, but by the end of the service the congregation must have numbered roughly 110. Most of the congregation were Greek, and the majority were female and/or probably above 50 years old. 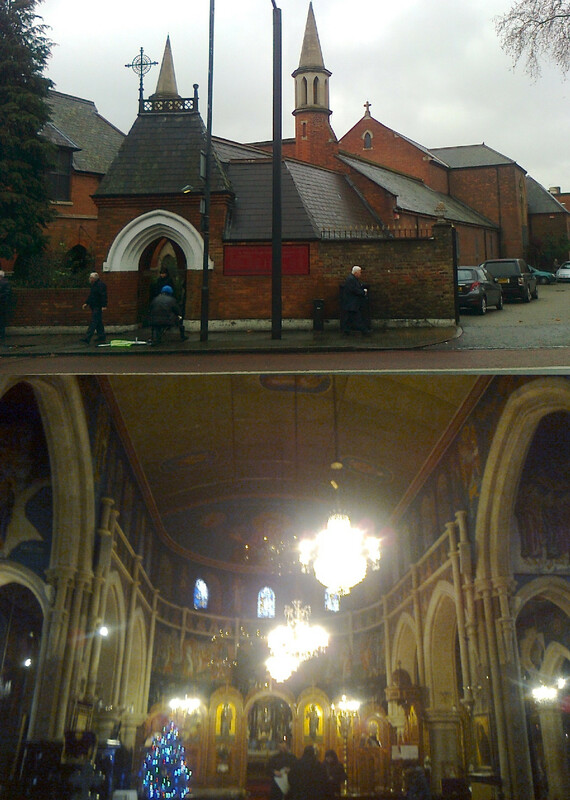 As with most Sunday morning Orthodox church communion services, the Liturgy of St. John Chrysostom was held when I visited, meaning that the service was very similar in structure to those I attended at Upper Norwood and Battersea. Unsure of when the service started due to the church not having a website, I arrived at 9:50 to find that the service was ongoing, but from the looks of it (only four others in the congregation, and one of the priests not yet in full vestments) had only just started. As with all Orthodox services (I explain this more fully in my review of Sts. Constantine and Helen), nearly all of it consisted of prayers, hymns and psalms being chanted (in Greek) by the priests or chanters. At 10:00, some bells rung; this usually marks the break between the Matins (morning prayers) and the Divine Liturgy (the communion service proper), but this happened far too early – and they rung again later at a more fitting time – and so I’m not sure what this signified. Ten minutes later, the elder of the priests exited the sanctuary with a Bible, holding it at the front of the church for the congregation to come up and venerate. The congregation at this point in the service was still so small – just under a dozen – that there was room for us to remain standing at the front while the priest processed with the Bible around the church to place it on a stand at the back, after which we went back to our places. Five minutes after that, the same priest processed around the church censing the congregation. There followed about twenty five minutes of chanting, after which at roughly 10:40 the bells sounded again, louder this time, signalling the start of the communion service. After just over an hour of more chanting and incense, during which there was a Bible reading and a procession with the bread and wine for communion (after which a small prayer was said in English – the only one in the entire service, so far as I could tell), and the Nicene Creed and Lord’s Prayer were said. At about 12 came a sermon from the younger priest (by this point the congregation had grown to about 80 people), after which there was a collection and some more prayers, during which at least 20 more people joined the congregation, and then communion was served by both of the priests at about 12:15. After communion, prayers for the dead were said, with members of the congregation holding candles in memory of departed friends and relatives. This was followed by a blessing, marking the end of the service at about 12:40. After the service, as is customary in Orthodox churches, the priests handed out small pieces of bread from a dish at the front of the church, the antidoron – this bread was blessed, and the communion bread was taken from the same loaf, but the antidoron is not considered consecrated communion bread. After receiving antidoron, most of the members of the congregation went into a courtyard of the church, where there were a few small craft stalls, and teas and coffees being served. Please note – this church caters primarily for the Greek diaspora. Unless set on becoming an Orthodox Christian (in which case there are other Orthodox churches in central London which could be considered more suitable for those with English as a first language), one may find it difficult (although by no means impossible) to settle in or to understand much of the service without an understanding of the Greek language. The church building was opened in 1878 as a Presbyterian church. At some point over the following century it became an Anglican church known as St. Andrew’s. 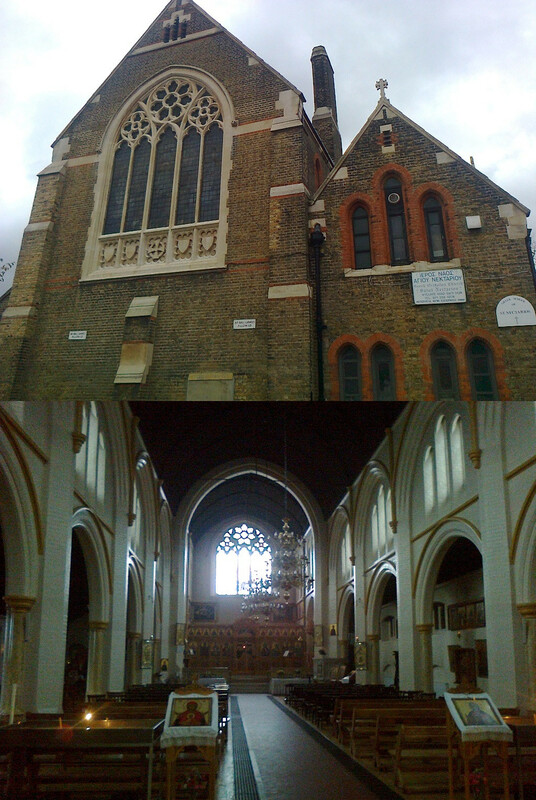 The Greek Orthodox community which now uses the church was established in 1967 and initially worshipped in an Anglican church in Croydon before buying the current building in 1976. The official inauguration of the church took place on 18 May 1980. Stepping inside this church, one could almost think they had stepped back in time into a church of medieval Byzantium, were it not for the electric lights. The sheer volume of icons, frescoes, and even a few mosaics is overwhelming. Inside this church, one is surrounded by Christ, Mary, saints and angels – the church on earth worships alongside the church in heaven. Immediately facing somebody entering the church are three icons – one of Christ, one of the Virgin Mary, and one of Sts Constantine and Helen (the patrons of the church). To the left of these is a tray of sand on top of a cabinet, in which several candles are placed. Beyond these icons and candles is the nave, with the pews separated by an aisle leading down towards the iconostasis. The iconostasis is a wooden structure between the nave and the sanctuary, inlaid with icons and topped with a cross. In the middle are the “Royal Doors” through which the priest enters and leaves the sanctuary, with curtains drawn across when the service is not ongoing. The sanctuary, glimpsed through the Royal Doors, contains an altar with ornate Bibles and lamps. Behind the iconostasis, on the wall at the front of the church, is a huge painting of the Virgin Mary, flanked by the archangels Michael and Gabriel and presenting Christ to the congregation. On either side of this large painting is a mosaic of Christ, one depicting the Harrowing of Hell and the other the Transfiguration. Around the top of the large painting are smaller paintings of various Old Testament patriarchs and prophets. In front of the Royal Doors hangs a shining gilded cross with a small depiction of the Crucifixion where the four beams meet. In front of this cross hangs a chandelier, and in front of this (now nearer the back of the church) another – these two chandeliers are enormous, inlaid with gold and small icons. Around the walls of the church are paintings of saints and several frescoes, mostly of Biblical scenes such as the Nativity and the Resurrection, but also (at the back of the church) two of church history: the First Council of Nicaea and the discovery of the True Cross by St Helen. The amount of artwork in this church is far too much for me to have noted it all down, and there are surely several aspects to the appearance of the church that I have missed out. The service was led by a priest in white and gold robes. He must have been taking the place of the church’s regular priest on the date that I visited, as he certainly was not the one shown on the church’s website. The priest was aided by two altar-boys and by an older man in a black cassock who may have been a deacon. There were three chanters, dressed in smart suits, and some men also in suits who spent much of the service performing “maintenance”-style tasks, who I have termed stewards (although I’m unsure if this is their actual title) – see below. The congregation was, unsurprisingly, overwhelmingly Greek, with perhaps about 10-15% of other ethnicities. There seemed to be a roughly even balance between men and women, with between half and two-thirds of the congregation elderly. The size of the congregation was at its largest (again, see below) just over 100, although the size and activity of the congregation made it difficult to count. The service was unlike any other I have reviewed so far. I arrived at the church at 9:45, when the service was scheduled to start according to the church’s website. Expecting a church bustling with anticipation for the start of the service, I was therefore extremely surprised to find the church empty other than two elderly ladies sitting in the pews and some muffled sounds coming from behind the iconostasis. Waiting to see if anything happened, five minutes later the curtain at the Royal Doors was drawn back and the priest begun the service, chanting prayers. The elderly ladies stood up and crossed themselves, and after ten minutes of the priest chanting, three men in suits strode boldly through the main doors and walked up to a lectern-like structure near the front of the church. Reading from a book there, they took up the chanting, with one of the chanters doing most of the work but having breaks courtesy of the other two chanters every once in a while. It is here that I should explain that Orthodox services – with some infrequent exceptions – do not have congregational hymns like most western church services. The vast majority of an Orthodox service is taken up by the chanting and singing of prayers, short hymns, and psalms, as was the case here. The chanters did most of this, alternating with the priest at times. The chanting was pretty much continuous throughout the service – the only times when there were pauses in the prayers were during the Bible reading and the notices. Over the following half an hour, more people began to arrive for the service. The initial impression of people arriving after the start of the service may be that it is disrespectful, but this seemed completely normal to everyone there. Upon entering the church, people would venerate the three icons by the doors by kissing them, then take a candle from a counter at the back staffed by the stewards and place it in the tray of candles after lighting it from one already there and saying a prayer. They would then go to the pews, greet a few of the members of the congregation, and either sit or stand. The candles would be left to burn until almost touching the sand, upon which they would be extinguished and removed by one of the stewards. At 10:10, I was treated to a rather unusual sight. One of the stewards, helped by a teenage member of the congregation, entered the church and walked down the main isle laden with lots of large loaves of bread on a tray and in bags, set them down on top of a table at the front, and then went back to their pews as if they hadn’t just moved half a bakery to the iconostasis (this bread did of course have a use – see below). Twenty minutes after the arrival of the bread, the priest, flanked by the two altar-boys holding candles, left the iconostasis holding a gilded Bible and after processing around the church with it held it at the front while members of the congregation went up to venerate it. After this, it was placed with the three icons near the main entrance for people to venerate as they entered, and the priest and altar-boys went back into the sanctuary. Five minutes later, they were out again, processing again around the church with the priest censing the congregation from a thurible. Twenty minutes of chanting after this, by which time the congregation had swelled to about 30, the chandeliers increased in brightness, the priest waved incense towards the congregation (although just from within the Royal Doors this time), and the bells in the church’s tower rung (very!) loudly. This signified the start of the Divine Liturgy, the communion service proper – what had just finished was the Orthros or Matins, the morning prayers. Now the worshippers arrived thick and fast, with the congregation doubling to 60 over the next twenty minutes. At 11:10, the priest took another gilded Bible from the sanctuary, and after another procession with it around the congregation stood in front of the altar and held it up, loudly saying “Sophia!” followed by a phrase in Greek, which I know roughly translates as “Wisdom; stand and attend!” After five minutes came the reading – the priest placed the Bible on a lectern in front of the iconostasis and read from it (in Greek, of course) before taking it back into the sanctuary. Five minutes after that, three of the stewards each took a standard of sorts from the sanctuary and stood with them in front of the Royal Doors. Each standard had a red piece of fabric with a picture on, topped with a golden cross or small circular icon. At 11:30, the priest left the sanctuary holding two chalices with the bread and wine for communion inside, with a red and gold piece of cloth around his shoulders. This was the start of the most important procession, the Great Entrance. The priest, the two altar-boys (each holding a candle) and the man in the black cassock (swinging incense) joined the three men with the standards (one of Christ, one of Mary, and one of who I think was John the Baptist) and processed around the church, escorting the bread and wine to in front of the Royal Doors. Once they got there, the others went back to their places while the priest went inside the sanctuary, placed the chalices on the altar, and slowly waved the piece of red and gold cloth over the two chalices (I have been told by different sources that this is either to keep flies away from the communion elements or to symbolise the tearing of the Temple veil after the Crucifixion – it may well be both). For the first time in the service, some prayers were then said in English. “May the Lord God remember you in his kingdom” was followed by several petitions (e.g. “pardon and forgive our sins and offences”, “may we live out the rest of our days in peace and repentance”) with a response in Greek from the chanters. This was followed by the Nicene Creed, said first in Greek by the priest and then in English by one of the altar-boys. There followed some more chanting, after which at about 11:50 came the Lord’s Prayer, again said first in Greek by the priest and then in English by the other altar-boy. The priest then blessed the congregation, the entirety of which sat down. Throughout the service members of the congregation had been either sitting or standing for various parts of the service – most sat for most of it, some stood for most of it, others seemed to go up and down like a yo-yo, but all had stood for the various processions. With everyone sitting, it seemed that there was somewhat of a break in the service, emphasised by the chanters going a bit more quietly and slowly. The stewards then passed round collection plates, and the chanting stopped completely as another steward made some announcements in Greek from the front of the church. By this time, the gradual influx of worshippers had increased the congregation to about 100 people, but from this point I do not think anybody else came into the service. After the announcements had been given (at about 12:00), the chanting started again and the priest came through the Royal Doors with the communion chalice. Inside the chalice were little cubes of the bread soaked in the wine – members of the congregation came up to the front and received communion from a spoon with which the priest scooped out a piece of the communion and placed it into their open mouths. In contrast to other churches where the majority if not all of the congregation will receive communion, only about a third of the congregation went up to receive it – in the Orthodox Church, communion is taken very seriously, with a recent confession and having fasted for the morning being required to take it. After communion, there was more chanting, during which some members of the congregation lit candles which they held – I learnt that during this part of the service, prayers were being said for the souls of the dead, and those with lit candles were praying for specific departed loved ones. After another ten minutes or so of chanting, the service ended at 12:25. I was told that this was apparently a little earlier than usual, probably due to the priest who was standing in for the church’s usual priest having conducted the service a little quicker. After the service, most of the congregation went up to the priest, now standing in front of the Royal Doors, and were given a small piece of bread from a metal bowl. This was the antidoron, bread which was from the same loaf as that used for the communion but which had only been blessed, not consecrated as the Body of Christ. Eating this is a means of fellowship for those who did not partake in the communion, and a means of alleviating the hunger of having skipped breakfast for those who had! Some of the congregation then stayed in the church talking to friends and relatives, whereas others left. On the way out of the church, departing worshippers could take large slices of bread from the loaves which had been brought in earlier.